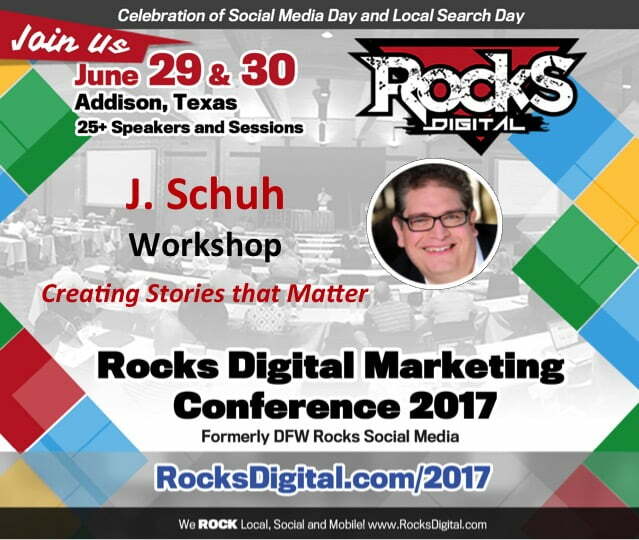 Award Winning Animator J. Schuh to Lead Workshop on Creating Stories that Matter | Rocks Digital 2017! J. Schuh is an award-winning Animator, Author, Speaker, Coach, and Film Producer. 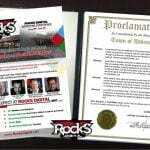 J. founded his company Toons-N-Design in 1998 and has produced animation, commercials, video games and films for over 20 years. His clients include American Airlines, AVON, Comedy Central, FedEx, and MTV. J. is currently the UX Coach at Sabre Holdings. J. Schuh has spent his career helping companies develop engaging content with stories that create value and achieve business objectives. As an adjunct professor, he has taught design communication and storytelling for 17 years at Southern Methodist University, Texas A&M Commerce, and Collin College. The best stories surprise us. They elicit an emotional response and create value for the listener. Great stories help us think and feel. They are valued for the lessons they teach and how they help us make sense of the complex world around us. 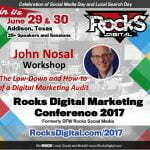 This session will provide you with insights, techniques and best practices to deliver engaging stories that will resonate. You will learn how to present and structure meaningful content related to the needs of your audience and the problems they are trying to solve. You will leave this session with an understanding of key methods and approaches to developing stories that will have your clients coming back for more. Learn #Storytelling Techniques from Award Winning Animator @schuhbox at #RocksDigital 2017!